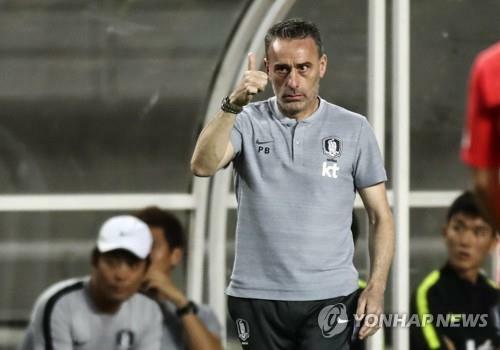 GOYANG, South Korea, Sept. 7 (Yonhap) — South Korea defeated Costa Rica 2-0 in a men’s football friendly match on Friday, giving their new coach Paulo Bento a victory in his debut before a sellout home crowd. Midfielder Lee Jae-sung knocked home a rebound after Son Heung-min’s penalty attempt rang off the post in the 35th at Goyang Stadium in Goyang, north of Seoul, while fellow midfielder Nam Tae-hee scored his first international goal in nearly two years for second-half insurance. The Korea Football Association (KFA) said 36,127 fans packed Goyang Stadium for South Korea’s first sellout at home since a friendly against Brazil in 2013. Jo Hyeon-woo, the No. 1 goalkeeper at both the FIFA World Cup and Asian Games this year, was ruled out with a knee injury, paving the way for Kim Seung-gyu’s first start in net in three months. Alvarado was down on the ground after attempting a diving save and watched helplessly as Lee’s reactive shot found the back of the net. But Nam, a 27-year-old veteran of the Qatar Stars League, wouldn’t be denied again in the second half. With South Korea coasting for an extended stretch while displaying less zip or intensity than in the first half, Nam provided a jolt with a highlight-reel goal in the 78th. Nam drove down the left flank and shed David Guzman just outside the edge of the box. He then cut toward the center and fired one to the top left-hand corner, well out of Alvarado’s reach, just before defender Bryan Oviedo could get to him. It was Nam’s first goal for South Korea since November 2016. Costa Rica didn’t have a shot on net in the first half and barely tested South Korean goalkeeper Kim Seung-gyu. Son wore the armband over Ki, who had been the captain since January 2015. Son served as temporary captain twice earlier this year when Ki was unavailable.